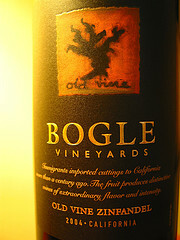 Bogle Old Vine Zinfandel 2004 is a big Zin at a small price. This wine’s nose is prominent, with dark berry, leather, and smoke notes. On the palate, this zin bursts with plum and cherry flavors, with oak and spice notes increasing in the finish. This is no wimpy red – it starts strong, and finishes long. According to the label, some of these vines have been producing since the early 1900s, leading to lower fruit production but more intense flavors. If you like a plummy, fruit-forward flavor, Bogle Zinfandel could be for you. The New York Times cited this wine in Who Knew a $10 Bill Had Such a Nice Bouquet? They commented, “a Bogle zinfandel, struck me as a little too sweet; yet zinfandel deserves to be on our list, as it was for years a foundation of inexpensive California wine before it began to get fancy.” We didn’t find a particularly high level of sweetness in our bottle. This entry was posted in Red Wines, Wine Reviews, Zinfandel on February 17, 2007 by Roger.